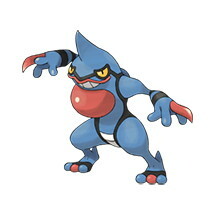 This page contains all the information available for Toxicroak in Pokemon Ultra Sun and Moon including the moves learnt by level up, egg moves and TM moves. Anticipation Warns when the foe knows 1-hit KO or super-effective moves. Dry Skin HP is restored when hit by Water-type moves or when it is raining but also makes the Pokémon weak to Fire-type moves and reduces HP during strong sunlight. Poison Touch When the Pokémon attacks its opponents with a move that causes physical contact, there is a 30% chance that the target is Poisoned.